It seems like this time of year it is all too easy to focus on our flaws. Instead of obsessing over the negative this summer, commit to making the most of your assets and follow these simple tips to feel more confident when you are enjoying your summer activities! Have a lake day planned with your pals? Get up a little early and go for a jog or do some yoga. Taking the time to work out, even if only for 15 minutes, on the day of a swimsuit clad event will make you feel more confident when the moment comes for you to bare that bikini! Spending a little time to take care of your body will make you happier and more confident in those summer outfits that usually involve showing a little more skin. Nothing makes a pair of summer sandals pop more than a bright and fresh pedicure. If you have an hour and $30, treat yourself to a professional service. If you are pressed for cash, cuddle up on the couch with a good movie and do it yourself! The tricks to a good at-home pedicure are 1) take your time, 2) use a high quality products and 3) don’t forget to clean up your cuticles and use a good thick moisturizing cream. Nothing says summer like perfectly bronzed skin. There are several ways to achieve that golden glow, just make sure you are getting in the safe way! Self tanner, bronzing gels and powders are all good alternatives to damaging direct sun or (God-forbid) tanning beds. Looking to really stand out from the crowd? Pair your perfect tan with a white or bright colored outfit! Your summer look should celebrate your natural beauty. Check out magazines and the web to find an easy summer do that doesn’t involve 30 minutes of your time and a super hot hair dryer. Nothing is worse than breaking a sweat before you’ve even left the house. 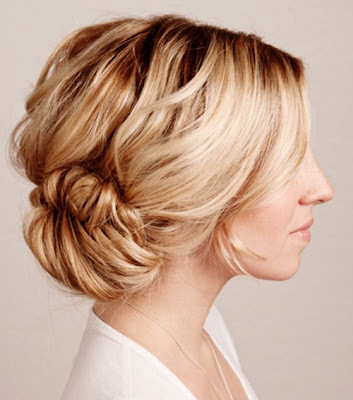 Whether it’s a Hunger Games inspired braid, the Pinterest sock-bun hit, or a perfect ponytail, picking an easy summer do that still makes you feel pretty is a necessity for staying confident in the heat. Summer beauty should look and feel effortless. A full face of makeup is not what summer is all about and isn’t very realistic for summer time activities! Try pairing your beauty regimen in the hotter months to include a lightweight foundation, a little bronzer, some water-proof mascara and a pretty lip-gloss. Not only will your natural beauty shine through, but think of the time you will save with your new mini routine! Watermelon. Suntan lotion. Lemonade. There are certain things that just smell like summer! Just like you put away your winter clothes and pull out your summer wardrobe when the heat hits, it is also a good idea to switch up your scent depending on the season. Look for something lightweight and airy that makes you happy when you smell it! Okay! Now you are ready to enjoy your summer with confidence and style. Send me pics from your summer fun days!